Die Schweizer Zeit sollte immer eines bleiben: schweizerisch. Wer wird sie künftig reparieren? Akkreditierte Journalisten und Blogger erhalten Zugang zu HD-Fotos und Pressemappen der Marken. 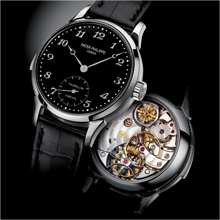 A unique Patek Philippe Stainless Steel Minute Repeater model, Ref. 3939, will be auctioned on September 22nd, 2011 at 4 p.m. in Monaco to fund medical research for the Duchenne Muscular Distrophy. 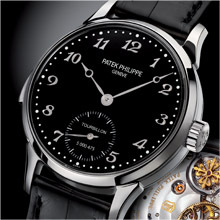 To support Only Watch 2011 Patek Philippe created for the first time a Stainless Steel Minute Repeater timepiece with a black enamel dial based on the emblematic Ref. 3939 model. The Only Watch 2011 special stainless steel model Ref. 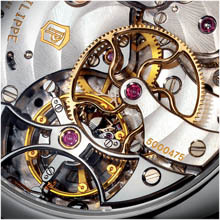 3939 is and will remain the one and unique piece ever produced by Patek Philippe Geneva. Patek Philippe hopes that the pure sound of the minute repeater chiming mechanism of this unique timepiece will support the message of hope for the Duchenne Muscular Dystrophy Research. Power reserve: 48 h max.